The area around Grande Prairie is rich with dinosaur fossils, although the setting is somewhat different than you might expect if you’re used to working in badlands like Dinosaur Provincial Park. In Grande Prairie, the only badlands outcrops are the Kleskun Hills, and most other sites are found along creeks and river valleys. I spent the bulk of my time at the Wapiti River bonebed, but helped out a little bit at the concurrent excavation at Pipestone Creek. The Wapiti River bonebed has yet to be described, but Pipestone Creek is a fairly famous locality because of the huge numbers of Pachyrhinosaurus that were collected there during the late 80s by the Royal Tyrrell Museum and featured in the touring exhibition Dinosaur World Tour: The Greatest Show Unearthed. This bonebed was reopened last year as plans for the new museum to be built in the area began to solidify. 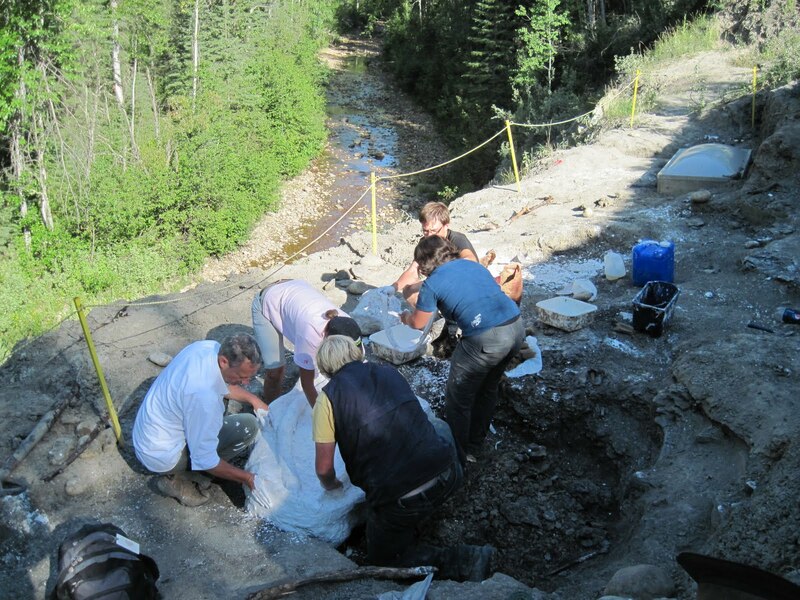 In 2008 the animals in this quarry were separated from Pachyrhinosaurus canadensis (found in southern Alberta), and named Pachyrhinosaurus lakustai after Al Lakusta who discovered the bonebed. Although material from the Wapiti River and Pipestone Creek bonebeds are currently accessioned at the University of Alberta, we’ve had a lot of help from the Grande Prairie Regional College, who have helped with many of the logistics of working in the area and allow us to stay at their dorms (it sure is nice to have kitchens, showers, and proper beds). Here’s a few photos from the last days of this year’s fieldwork at Pipestone Creek. The Pipestone Creek bonebed is incredibly dense, and I’ve been told that upwards of 100 bones have been found in a single square meter here. 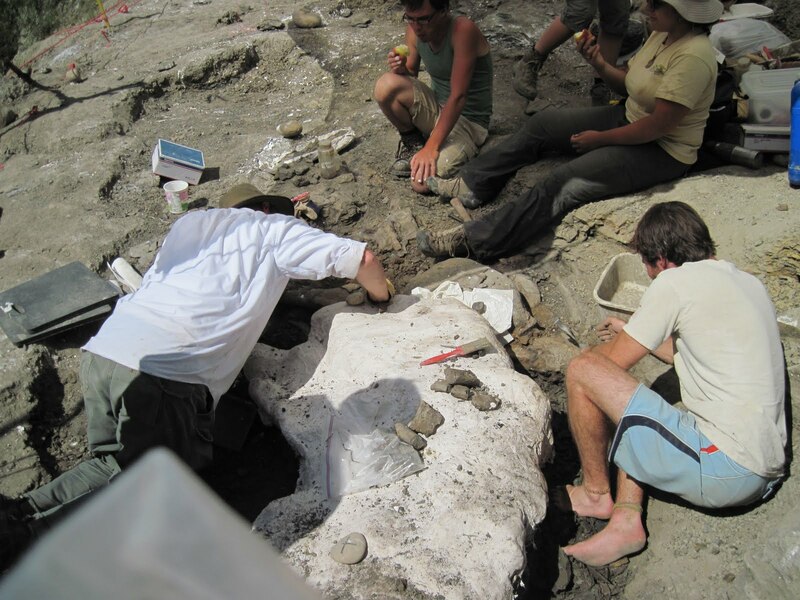 We were particularly excited this year because a very fine P. lakustai skull was uncovered, which you can see here as the large jacket. We had to jacket a bunch of smaller bones along with it because they sit partially underneath the skull and could not be removed. They’ll be extracted back at the lab. Here the skull has been flipped and the crew jackets the underside in preparation for transport. Pipestone Creek is a much easier site to access than Wapiti River. As you can see, the bonebed is not far above the creek, and a road has been constructed to allow visitors an easy walk to the site. 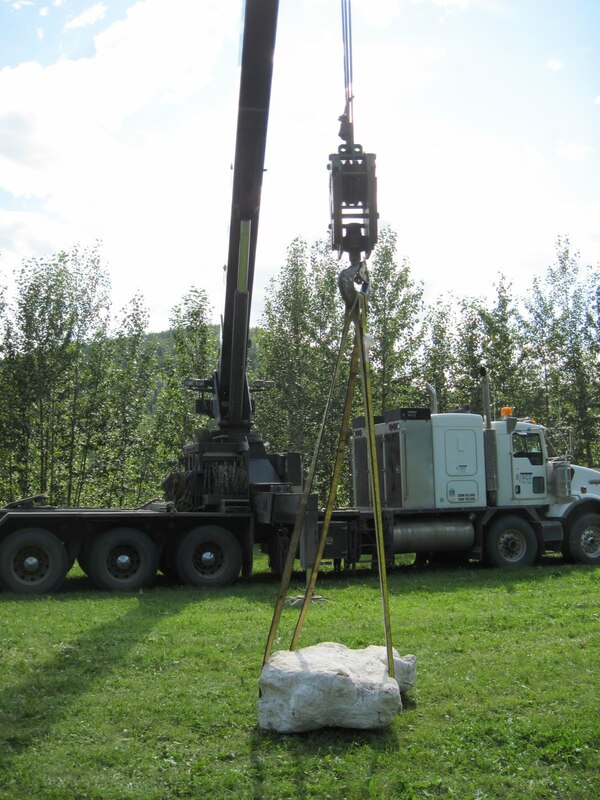 Helicopters are essential for getting large-ish jackets out of the Wapiti River bonebed, since the hill is too steep and high to easily get large jackets up to the edge and into the truck, or down to the river and into jetboats. 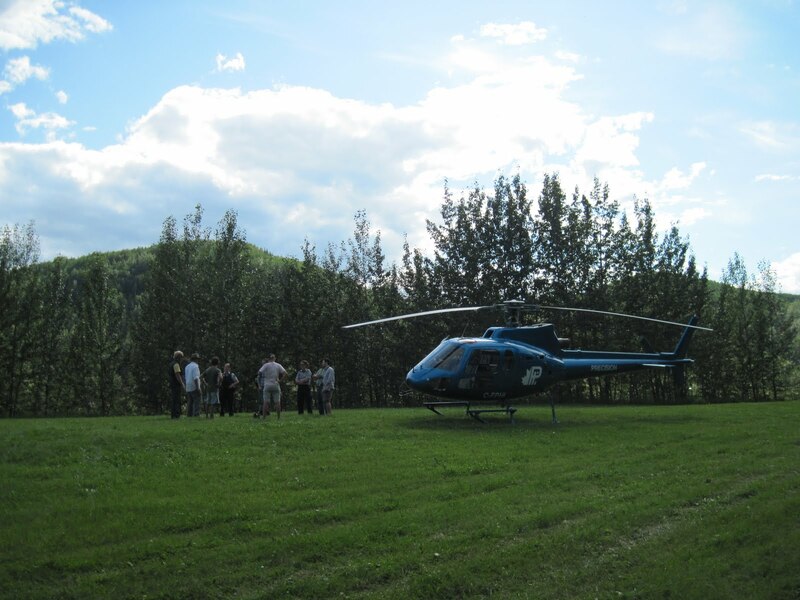 This year, the helicopter was also a much needed tool for getting the large skull jacket out of Pipestone Creek. Here it sits in a field at the campground after three successful lifts. I’ll probably have more updates as some of this material is prepared at the U of A, but that concludes my Grande Prairie fieldwork for this year. You can keep up to date with the goings on up there by keeping an eye on the museum project, formerly called the River of Death and Discovery Dinosaur Museum and recently been renamed the Philip J. Currie Dinosaur Museum. They have a pretty nifty new website (and blog, which you can find on the blogroll here). Is the Wapiti River site as dense as the Pipestone Creek bonebed?